Bottom line: Learn 18 tips & shortcuts to save time with writing VBA macros for Excel or other Office applications. At the beginning of last year I wrote a popular post on 17 Excel Shortcuts for 2017. I decided to continue the tradition this year and write a post on tips & shortcuts that will save you time when writing VBA macros. These are some of my favorite tips, and also some favorites from the blog, YouTube Channel, and my VBA Pro Course. 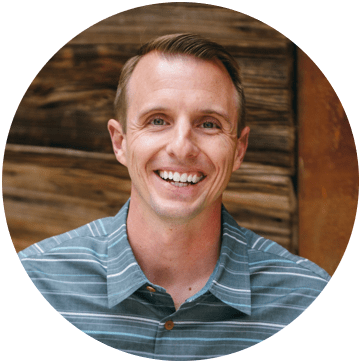 If you're not familiar with VBA yet, but always wanted to learn, then checkout my upcoming webinar on “The 7 Steps to Getting Started with Macros & VBA”. Here is a printable PDF version of the article. The VB Editor is the application we use to write macros and create userforms. It can be opened by clicking the Visual Basic button on the Developer tab in Excel. The keyboard shortcut to open the VB Editor in any Windows version of Excel is Alt+F11. The shortcut in the Mac version is Opt+F11 or Fn+Opt+F11. If you are using a laptop keyboard then you might also need to press & hold the Fn key before pressing F11. The function keys on laptops are typically multi-use keys, and require the Fn key to be pressed to activate the function keys (F1–F12). Some laptops have a Fn Lock feature that makes the function keys primary, which means you won't have to press the Fn key when pressing F1-F12. Checkout my article on the Best Keyboards for Excel Keyboard Shortcuts to learn more. The Personal Macro Workbook (PMW) is a great place to store the macros you use often. This workbook opens in the background every time we open Excel, making our macros easily accessible. We can also create custom toolbars with buttons to run our macros. I like to think of the PMW as our Excel tool belt that can save us time with task we do every day. For example, I have an article with a macro that creates a list of unique values on a new blank sheet. We can store this macro in our PMW and assign it to a button in the ribbon or keyboard shortcut, and then run it any time on any open workbook. Checkout my free video series on how to create your Personal Macro Workbook to learn more. There is also a video in that series on how to add macro buttons to a custom ribbon. This is definitely one of the keyboard shortcuts I use the most in VBA. When we are typing code, Ctrl+Space opens the Intellisense drop-down menu that contains a list of matching objects, properties, methods, constants, and variables. Start typing a line of code like ActiveCell. You will see a list of all VBA words that start with Act. Then press Tab or Enter to complete the word. It saves time with having to type long words and variable names. It prevents typos because VBA is completing the words for you. These benefits can be a HUGE time saver when debugging your code. We typically also see the Intellisense drop-down menu after typing a period (.) in the VB Editor. However, sometimes it doesn't work. One common case is with the Worksheets property. If we type Worksheets("Sheet1"). , we do NOT see the Intellisense menu. This can be frustrating and cause you to think that Intellisense is not working. Use the CodeName of the worksheet we want to reference. This is my preferred method for referencing worksheets because the code will not break if a user changes a sheet name. Set the worksheet to a Worksheets object variable first. Then when we type the variable name followed by a dot (ws. ), the Intellisense menu will appear. We can add comments to our code that help explain what each section of code does. To create a comment in VBA you type an apostrophe at the beginning of the line. Once you move the text cursor off the line, the text will turn green. The green text makes it easy to distinguish comments when reading code. VBA completely ignores comment lines, and you can add as many as you'd like. Commenting your code is somewhat of a controversial topic. Some developers believe that properly written code should speak for itself, and that you don't need to add extra comments. I see their point, but this doesn't work for me for two reasons. When I come back to my own projects months/years later, I don't remember what the entire macro does. Comments are like headings in this blog post, and make it easy to scan through the macro to find the section you are looking for. They also quickly tell us what each section does. The keyboard shortcut to step through each line of code is F8. The Mac equivalent for Step Into/Through is Cmd+Shift+I. This allows us to test and debug each line of code in our macros. We can also open Excel side-by-side with the VB Editor (or on a separate monitor) to see the actions being performed in Excel as each line runs. A lot times this can help you quickly find an error with a sheet or range reference. Click inside the macro you want to run. You can click any line of code. The macro will always start at the top. The macro name will be highlighted yellow. Press F8 again to run that line and highlight the next line. Continue to press F8 to run each line. It's important to note that the yellow highlighted line has NOT been run yet. It will be run when you press F8 again. I cover this technique in more detail in my free upcoming webinar on “The 7 Steps to Getting Started with Macros & VBA”. The sheet controls for buttons that run macros are a bit dated looking. Fortunately we can also use any shape in Excel to run a macro. The shapes can be colored and formatted to make them look more like modern buttons you find on the web and mobile apps. Insert a shape on a worksheet, and format it to your liking. This will usually be a rectangular or circle shape that contains text. Right-click the shape and choose “Assign Macro…”. Select the macro from the list and press OK. The macro will usually be one that is stored in the same workbook as the shape. Click off the shape by selecting a cell in the worksheet. When you hover the shape the cursor will change to the hand pointer. Clicking the shape will run the macro. I recommend having a Yes/No message box appear before the macro actually runs. This prevents any accidental button presses. Checkout my video on adding a Yes/No message box to your macros. It's part of my video series on the Personal Macro Workbook. We tend to do a lot of the same tasks over and over again in Excel. This can be tasks like: applying formatting to multiple ranges/sheets, creating a list of sheets, copying data to each workbook, setting filters on each pivot table, etc. Loops are one of the most powerful tools in VBA that allow us to automate these tasks. The loop will loop through each item in a collection (think worksheets in a workbook or cells in a range), and perform whatever code you like on each item. There are a few different types of loops, but the For Next Loop is the most common. Checkout my in-depth article on The For Next Loop in VBA for more details on this must-know coding technique. In my free upcoming webinar on “The 7 Steps to Getting Started with Macros & VBA”, I explain how to use a For Next Loop to list all the sheets in any workbook. This creates a quick table of contents with a click of a button. This is another controversial topic, but I require (politely ask) that all members of my VBA Pro Course use Option Explicit. Option Explicit requires us to declare all variables. When we see lines of code with Dim statements at the top of a macro, this is declaring a variable. We are basically telling VBA to create the variable in memory to be used later while the code is running. We can then set values or references to objects to these variables in the macro below the Dim statement. The MAJOR benefit with Option Explicit is that it prevents typos and saves time. The VB Editor will throw a Compile Error: Variable Not Defined when you try to run the code if a variable in the code is not declared. It will also highlight the variable so you can declare it or fix a typo. If you don't have Option Explicit on and misspell a variable, the code will still run and can produce errors in the results. If your macro is long then then it can take A LOT of time to find these typos. Trust me. Been there done that! To turn Option Explicit on you simply type the words Option Explicit at the top of the code module. You can also have the VB Editor automatically add the words to new code modules by going to Tools > Options > check the “Require Variable Declaration” checkbox. Option Explicit will now appear at the top of each NEW code module you create. There are a lot of benefits of using Excel Tables in our workbooks. They save time with formatting data, auto-fill formulas, and work great as the source of a pivot table. Excel Tables also make it much easier to write VBA code for dynamic ranges of data. This is a list or data set where the number of rows or columns is constantly changing as you get new/updated data. For example, the following line of code references the cells in range A2:A15. That is a hard-coded range reference. If you add new data to the bottom, you will have to manually change the code to include the new rows. However, if we store the data in an Excel Table and reference the Table column, we don't have to worry about this. The following line of code references the same column. The advantage here is that the code will automatically include new rows added to the Table. No manual updating or maintenance of the code is needed. We can also reference Excel Tables with the ListObjects object, properties, and methods in VBA. There are definitely some advantages to using ListObjects when it comes to modifying the Table structure (adding/deleting rows/columns) and properties, and looping through the Table. Checkout my good friend Chris Newman's article on ListObjects in VBA for more examples. The Macro Recorder is an amazing feature of Excel and VBA. It creates VBA code as we take actions in Excel. For example, after we turn the macro recorder on, we can go do our normal work in Excel like writing formulas or copying and pasting data. The macro recorder will create all the VBA code for these actions, and store it in a code module. This is a great tool to use when we are first start with macros. And it's also a great tool for learning and getting snippets of code. The Excel object model is massive, and it's impossible (for me) to memorize all the property, method, and object references. So the macro recorder is a great way to get some code for a pivot table, list object, slicer, shape, or any other object you are not familiar with. The macro recorder also has its limitations. It's NOT going to create code for loops, if statements, error handling, message boxes, etc. We need to learn how to write code to implement these more advanced techniques that allow us to fully automate processes and create applications in Excel. Checkout my free upcoming webinar on “The 7 Steps to Getting Started with Macros & VBA”. The Immediate Window in the VB Editor allows us to run a single line of code. We can run an action (method) on an object, or return the result of the code back to the Immediate Window. Maybe we want to determine how many worksheets are in a workbook. Type ?Worksheets.Count and hit Enter. The result will be displayed on the line below. The Immediate Window is also the place that the Debug.Print method outputs to. Checkout my article on 5 Uses for the Immediate Window in VBA for more details. We can also assign keyboard shortcuts to run macros that we use frequently. I recommend storing these macros in your Personal Macro Workbook. Press the Macros button on the Developer or View Tab in the ribbon. Select the file that contains the macro from the Macros In drop down. Select the macro from the list box. Type the letter in the Shortcut key box that you want to assign the macro to. All shortcuts will start with Ctrl. You can hold the Shift key while typing the letter to create a Ctrl+Shift shortcut. This is usually recommended because most of the Ctrl+key combinations already have dedicated keyboard shortcuts in Excel. Press OK and close the macros window. You can now press the shortcut key combination to run the assigned macro. Sometimes you will want to make sure the user has a range (cells) selected before your macro runs. If they have a shape (chart, slicer, etc.) selected then this might cause errors in your code. For example, I have a macro that deletes the blank rows in the selected range. For this macro to run properly the user needs to have a range of cells selected first. Here is code that will check if a range is selected. MsgBox "Please select a range first. ", vbOKOnly, "Select Range"
The TypeName function returns the data type or name of the object for a given variable or object. In this case it evaluates the Selection and returns the type of object that is selected. If it's not (<>) a range, then the If statement is true. You typically want to put this at the top of the macro. If a range is NOT selected then a Message Box (pop-up window) will appear that instructs the user to select a range. The Exit Sub line will end the macro. 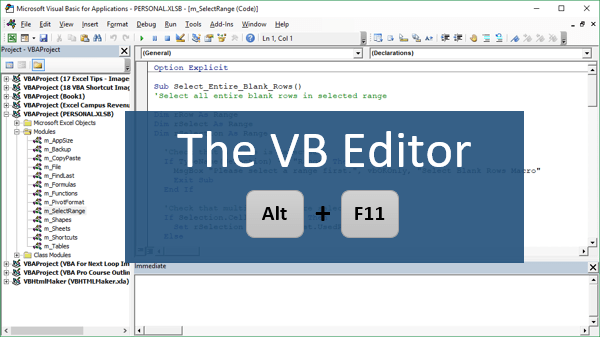 In the VB Editor, Ctrl+Y deletes the line of code that the text cursor is in. This creates a lot of confusion since Ctrl+Y is typically used for the Redo command in almost every other application, including Excel! If you look at the Edit menu in the VB Editor you will see that there is no dedicated shortcut for Redo. We can use Alt, E, R as an alternative shortcut for Redo. This is just one of those weird quirks of VBA that is really good to know. This is another great keyboard shortcut to know. Ctrl+i displays the screentip that you see writing or running code. This allows you to see all the parameters in a property, method, or function. Place the text cursor in the word you want to display the info screentip for. Press Escape to close it or move the cursor. If you have variable selected within a line and you want to see the parameter info instead of the variable's value/data type, then press Ctrl+Shift+i to see parameter info. The Ctrl+J shortcut will open the Intellisense drop down menu that displays a list of objects, properties, methods, variables, etc. I typically use this when I've typed a partial line of code and ended it with a period, like Range(“A1”). I then want to come back to that line and see the Intellisense drop down. Pressing Ctrl+J opens the menu. Otherwise, you have to delete the period and type it again. We can also use Ctrl+J to select a different variable from the list. If you used the wrong variable name somewhere, or need to change it, hit Ctrl+J to see a list of the variable names. If you prefix your variable names (aka Hungarian notation), then the other variables should be pretty close by in that list. Did you know we can use worksheet functions in VBA? These are functions we use in a formula in Excel like: vlookup, match, countif, max, min, etc. Type WorksheetFunction. in a macro to see a list of all the Excel functions that are available in VBA. This is the best of both worlds in my opinion. We can use the power of Excel functions in our VBA code. The screentip for the function shows the number of arguments, but it does NOT show the names of the arguments. So we typically need to type a formula in Excel to determine what each argument is (unless you have them memorized). The worksheet function I use the most often in VBA is Match. We can use Match to lookup a value and return the row or column number of the cell that contains the matching value. This can sometimes be easier then using the Range.Find method. Checkout my article & videos on how to find the last used cell on a sheet for more on the Range.Find method. What Is Your Favorite Shortcut or Tip for VBA? I hope you enjoyed that list and learned something new. Maybe this has inspired you to learn more about macros & VBA. If so, please checkout my free upcoming webinar on “The 7 Steps to Getting Started with Macros & VBA”. I would also like to know what your favorite tip or shortcut is that was not included in this article. Please leave a comment below and share yours. There are no right or wrong answers, and this will be a great way to learn from everyone. The reason why “IntelliSense” doesn’t work for “Worksheets” is, because the property “Worksheets” is of type “Sheets”. But “IntelliSense” only could “work” for ONE of these sheet types, because they do have different methodes and properties. How can we customize the Symbol or get a new icon not in the list? I do it via xml editor, is there another way? I entered Ctrl + Shift + f but it wouldn’t take. The key is to NOT press the Ctrl key. The Ctrl appears to be default so all you need do it press Shift + f (or whichever key you want to use). After you press Shift+v (then Enter? I don’t recall) it shows the image Jon put in the tip with the Ctrl + Shift + F.
#15 – “including” Excel, or “excluding”? This is a super collection of tips. I learned quite a few tricks that I can use right away (TypeName, Ctrl-i, Ctrl-j and the explanation for worksheet Intellisense). My favorite shortcut doesn’t originate in Excel: I create boilerplate code snippets in CodeSmith and paste them into the IDE. Very nice… like you Jon, I try to learn something new in excel each working day. A quick way to navigate a module is Ctrl + Up Arrow or Down Arrow. This allows you to go from one subroutine to the next or previous. You had a lot of great information listed here! Thought you might like this. I have been using MS Office from the 80’s and teaching it for the last 18 years. Many changes in that time. I find your ideas to be first class. Thanks. You will not always want users to be able to print data, (confidential data is an example).This can be achieved by using VBA. Add the procedure to ThisWorkbook module. You can add a message box, which would remind the user that printing this workbook is not allowed. If someone attempts to print the sheet it will result in a message box on the Excel sheet. Thank you Sir! I really appreciate the nice feedback and your support! Thank you Jon!All of your makro tips 2018. Its usefull for me. I am just beginning to write macros and saved the ones I wrote to the “personal workbook”. When I try to edit any of the macros in the Personal Workbook I am asked to unhide it. How do I unhide a Personal Workbook? Thanks Jon, for these great tips. I use some of them and good to know the rest which are very handy. My favourite tips are Macro recorder and For-Next loops. They are very powerful, particularly when using pivot tables and slicer. “Worksheets” may not give you the IntelliSense you expect. Your screenshot shows “Worsheets”, which also will not. #2 – Store Your Macros in The Personal Macro Workbook is my personal favorite, although all of the tips are great! It is truly like having a tool belt for automating common tasks in Excel. Thank you! I’m a long-time coder in VBA (Word, Excel, Access) but did NOT know about the IntelliSense invokers (3, 4, 16, 17) or WS functions (18). Way cool stuff (as always)! My favourite tip is to use the “Compile VBAProject” from the “Debug” menu item. Just click on “Debug” and the the option “Compile VBAProject”. That picks up all errors before running or stepping through a Sub. It has saved me loads of time and trouble over the years. Great tip! Thank you Ben! The keyboard shortcut to Compile VBAProject is Alt, D, L.
While the cursor is pointing at a subroutine that is being called use Shift+F2 jump to that subroutine in the code. And Ctrl+Shift+F2 jumps back to where you started. Great tips reference Jon, very much appreciated..:-) For my best tip I would recommend the use of fully qualified statements when the syntax supports it. It is along the same line of thinking expressed in your comments tip. You never know who, or what the skill level is of the person that will follow you and take up responsibility for your code. Troubleshooting code and particularly data problems that casue errors are easier accomplished if you don’t have to spend excessive amounts of time determining exactly what the object hierarchy is that any given line of code is executing against. For long sub procedures that execute on multiple workbooks and worksheets in the workbooks real worksheet names are particularly useful in your statements. I have found that descriptive variables names for workbooks are generally easy enough to follow. First, it means I can use Cells(Row,Col) to identify a value. This has saved me hours of programming and debugging time. Third, by making them Public, I can refer to them in any subroutine or function I need to. Constants that I want to keep private, I declare in the specific subroutine. P.S. I use longer names, as shown above, to correspond to the meaning of each column. Takes a little longer to type, but clearly documents what data I am referring to. Donl, you usually place your constants at the top of the particular module you’re working in or do you create their own separate module? I put them at the top of the module. I create one module for each client project typically, so it is easier to simply export/import the module. Declaring them Public makes them available to any module. I’ll often use the company name as part of the constant (intABCFirstName) to help distinguish and keep separate. Thank you for all the makro tips 2018…its usefull for me. Happy New Year Jon! Once again you have provided an invaluable resource of Excel information. All of your articles are deeply informative and presented in an appealing graphic manner. Thanks for sharing your skills! !